Thanks to all of our supporters who made January 12th's Southern Food issue launch a major success! At the top of this list is Chef Sean Brock and Husk Nashville for allowing us to hold the launch at Husk Nashville. Wow! This was our largest issue to date, weighing in at 134 pages! The issue has work by 30 writers, eight poets, and four photographers. Many of them were in attendance at the launch! In addition to our big interview with Chef Brock, there were seven additional Q&As. 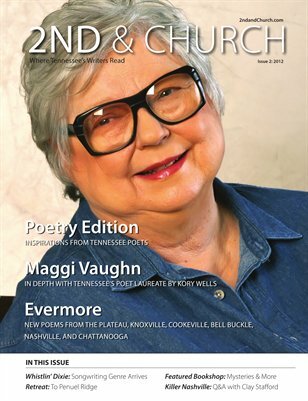 And the issue includes two large photo galleries, eight book reviews, 25 press releases, 15 feature stories, eight poems, 11 columns, two academic papers, and one piece of flash fiction. Click here to access the photo gallery! Often, we are asked how to get a copy of our issues if someone misses a launch or if the issues at a launch run out quickly, which happens all the time. 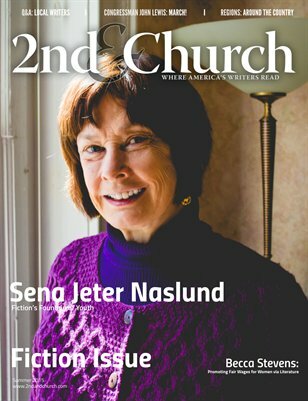 2nd & Church is designed to be a traditional, paper product, and that’s how we prefer readers to experience it. Single issues are for sell at HP's MagCloud online service, a single platform for digital and print magazines and journals. Translation: our publisher! To purchase an issue, click on the cover of the issue you would like to purchase, located on the right-hand side of this screen. In this case, the cover featuring Chef Sean Brock. MagCloud will want you to sign up in order to purchase a copy. Signing up is free and safe. To view the issue online now, for free, without signing in: After you click on the Southern Food issue’s cover, the MagCloud ordering screen will appear. On the cover, you will see a red tab labeled, “Read Now.” Click that tab. It’s that’s easy. A viewer will launch, and you’ll be able to scroll through the issue. Enjoy! 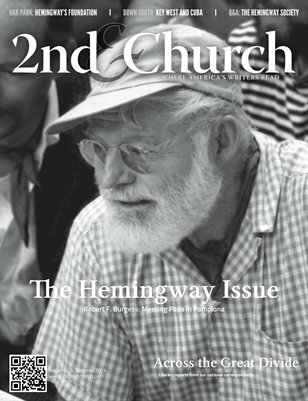 To download a PDF of the issue: We understand that hard copies of 2nd & Church can be expensive. Please know that there is NO markup on any of our issues. We use print-on-demand technology to publish our journal, ensuring a high quality product, and that is an expensive way to go. To offer you an alternative, we post PDFs of each of our issues online. Click HERE to download and view a PDF of our Southern Food issue. Enjoy! 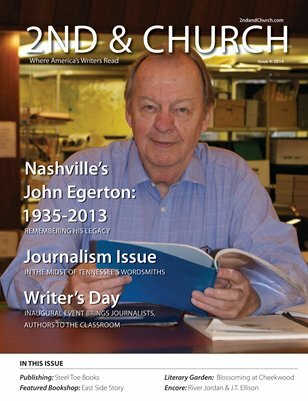 One More Way to Acquire a Free Digital Copy: Got iPad? If you do, then do you have the MagCloud app? 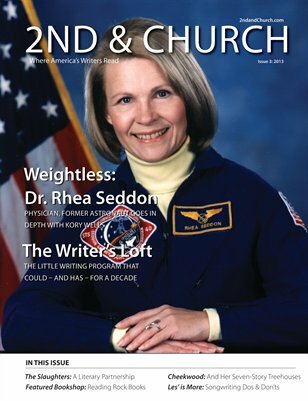 It is free and allows you to download all sorts of FREE publications, including 2nd & Church! Fire it up and search for us. Many of our issues are available to our readership via this app, including the Southern Food issue. Happy reading and thanks for your on-going support! Whenever possible, I do a lot of thinking while visiting a bridge behind Cherry Hall, at Western Kentucky University-especially in the wintertime. ...and I’ve been thinking a lot about my Aunt Carol over the last couple of months. Since leaving my small Kentucky town in the mid-1980s, I saw her just a single time, and that visit was brief. Click here to read the complete From the Editor column! 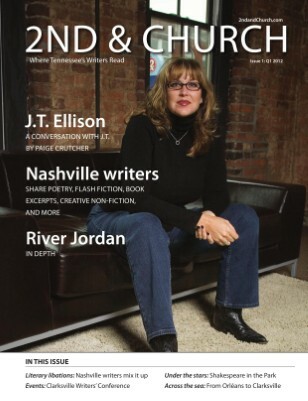 Southern Food Issue Complete, Logistical Information for Jan. 12 Nashville Launch! Parking: There is plenty of free parking. Husk Nashville is located at 37 Rutledge St. in downtown Nashville. There is parking in the back of the building, as well as on each side. Starting at 5:00 p.m., you may also park for free in the parking lot across from Husk. They have an agreement with that company. You will not be towed. Promise! Reservations: Our event is from 6:00 to 8:00 p.m. Dinner service at Husk is 5:00 to 10:00 p.m. Typically, dinner reservations are not required, but if you are planning on eating dinner at Husk either before or after our launch, then their meeting planner indicated that it might be a good idea to have reservations…just in case. Their phone number is 615-256-6565. Dress Code: There really is not a dress code. Blue jeans are fine. As long as you have on jeans, shoes, and a shirt, you’re cool. Of course, some people choose to dress up, but it is not required. We hope to see you at the launch! And if not, we will post a PDF of the issue to our web site after the formal launch. We are thrilled to announce that our Southern Food issue--featuring James Beard Award-winning Chef Sean Brock--will launch on January 12, 2016 at Husk Nashville, located at 37 Rutledge St., downtown Music City. It will last from 6:00 p.m. to 8:00 p.m. This is our largest issue to-date. At the time of this announcement, the layout is 82 pages, and we expect it to reach around 110 pages by completion. As always, there will be free copies on site during the event, while supplies last! In addition, we will be providing free samples of Chef Brock's local Southern specialties, on a first-come, first-serve basis. Dinner service will last until 10:00 p.m., so why not make plans to stay after the launch for some great Southern food?! The launch is not just for contributors. Bring a friend and plan on having a great time! Please enjoy the following free preview of some of the issue's pages! In anticipation of the issue’s launch in January 2016 at Husk Nashville, we’re sharing with you—gentle reader—some of the recipes that will be in the issue. As you might guess, this issue will include cookbook reviews and pieces connected to cookbooks. Many publishers have allowed us to reprint a few recipes, as long as they are used in promoting their books, which we are thrilled to do. From now until January 12, 2016, we’ll be sharing with you 21 recipes from six books. Please sit back and enjoy while we wrap up the issue. As each recipe goes online, it will be hyperlinked to a menu of all 21 items. Click here to access the menu. 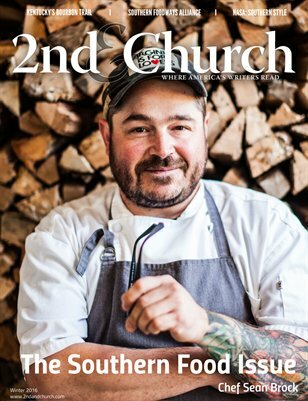 Cover Story/In Depth Interview with Chef Sean Brock. You may have known that Chef Brock has been resurrecting and growing crops that were at risk of extinction, that he is a passionate advocate for seed preservation and continues to grow a number of heirloom crops, but did you know that he studies and collects 19th century Southern cookbooks to educate himself on Southern food history and discover new ways to resurrect antebellum cuisine? We’re sure that we’ll be talking to him about all this and more! Feature Story on Husk Nashville, located on Rutledge Hill in a complex of buildings dating back to the 1890s. An Evening with Chef Sean Brock. In December, Parnassus Books and POP present An Evening with Chef Sean Brock, who appeared in conversation with singer-songwriter Jason Isbell as part of his fall book tour for Heritage. We were at the event, reporting on it as a sidebar piece. Local writer Candace White reviews Chef Brock’s book, Heritage. She’ll be cooking a few of the recipes and writing a column for us about her adventures. We will run a piece that shares the good work of South Carolina-based Anson Mills, advocates for heirloom grains…and so much more! Q&A with Dr. David Shields and review of his book, Southern Provisions. There will be a feature story on The Mountain Heritage Literary Festival at Lincoln Memorial University in Harrogate, Tennessee. Local writer Katie McDougall explores the Southern Foodways Alliance’s efforts to document Southern food. We’ve scheduled a story on the Southern Food & Beverage Museum (in New Orleans), focusing on the SoFAB Culinary Library & Archive and The Menu Project. Technical writer and motorcyclist Jennifer Eskew leads a motley crew across Kentucky's bourbon trail, "feasting on asphalt" style, cooking selections along the way from the book Bourbon: a Savor the South Cookbook by Kathleen Purvis. Alongside the Cumberland Plateau of the Appalachian Mountains, the Lodge Manufacturing Company in South Pittsburg, Tennessee continues to do what it has been doing for over a century: forging both high quality cast iron and American jobs! Our writers and photographers will be heading there in 2015 to report back to our readers. This is a new category, in which we have a brief conversation with someone connected to the book business. You'll discover a review of Okra: a Savor the South® cookbook, by Chef Virginia Willis. Adrian Miller's Soul Food: The Surprising Story of an American Cuisine One Plate at a Time is the winner of the 2014 James Beard Foundation Book Award for Reference and Scholarship. We're proud to run a review of Mr. Miller's book. Through our review, readers will be able to explore The Storied South: Voices of Writers and Artists, by William Ferris. After playing Erin Walton—Yes, THAT Erin Walton— Mary McDonough went on to write books. We’ll review her latest novel, One Year. Our review of Henry Chappell’s Silent We Stood will make a great piece of reading. The honey bee is mysteriously disappearing - a "mystery" that has provoked much human thought and concern. Enter Beesch: A Story of the Destiny of Honey Bees by Ray Carpenter. This is the story of identical twin female worker honey bees - a story that is interlaced with a narrator storyteller who shares the story of the honey bee, its hive, and its environment—exploring the reasons behind the bee’s disappearance along the way. Deirdre Scaggs is the Associate Dean of Special Collections at the University of Kentucky Libraries. The University Press of Kentucky just published her book, The Historic Kentucky Kitchen. We’re excited to include most anything involving Kentucky. Our columnists will have some literary opinions to share and discuss. 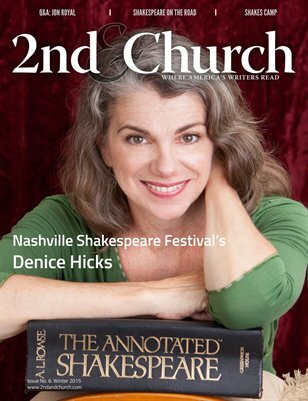 You’ll find Chuck Beard (Nashville Local Literary Scene), Gayle Edlin (Technical Writing), Janelle Hederman (Writing for Children), Les Kerr (Songwriting), and Julie Schoerke (Book Business). Oh yeah, we’re thrilled to announce that we’re adding two new columnists starting with this issue: Molly McCaffrey, our literary film critic; and Randy O’Brien, our audio book reviewer. More on Nashville Chef Sean Brock! We are thrilled to announce that James Beard Award-winning Chef Sean Brock will be the cover story/In Depth interview for our first-ever Southern Food issue, out in January 2016! Chef Brock has a professional relationship with Nashville stretching back over a decade. In 2003, he became executive chef at the AAA Five-Diamond Hermitage Hotel in Nashville. Brock spent just under three years fine tuning his craft in Nashville before accepting a position as executive chef at McCrady’s Restaurant in Charleston, South Carolina. In November 2010, The Neighborhood Dining Group and Brock opened their second restaurant, Husk–a celebration of Southern ingredients, only serving food that is indigenous to the South. Inspired by Husk’s success in Charleston, Neighborhood Dining Group and Brock opened a second Husk in Nashville in 2013. Located on Rutledge Hill in a complex of buildings dating back to the 1890s, Brock and his team reinterpret the bounty of the surrounding area, exploring an ingredient-driven cuisine that begins in the rediscovery of heirloom products and redefines what it means to cook and eat in Nashville. In September 2011, Bon Appétit magazine named Husk “Best New Restaurant in America,” and in February 2014, GQ named Husk Nashville one of the 12 Most Outstanding Restaurants of the year. In 2010 he took home the James Beard award for “Best Chef Southeast,” and he appeared on Iron Chef America in December 2010, taking on Michael Symon in “Battle Pork Fat.” In the fall of 2013, Brock hosted season two of Anthony Bourdain’s The Mind of a Chef on PBS. "My favorite ball cap, made by Billy Reid, has a patch on the front that reads “Make Cornbread, Not War.” I’m drawn to it because cornbread is a sacred thing in the South, almost a way of life. But cornbread, like barbeque, can be the subject of great debate among Southerners. Flour or no flour? Sugar or no sugar? Is there an egg involved? All are legitimate questions." Click here to read more from Chef Brock, including his recipe for Cracklin’ Cornbread!